• Lovin’ The Smash – Publisher Kell Phelps shares his favorite “Smash Burger” recipe. • Diner Pie Cake – A Mazie Q pit boss Jayna Todisco shares her recipe for this American classic. • In The World Of BBQ, It’s The People You Meet – Mark Noordsy shares his sausage making experience. 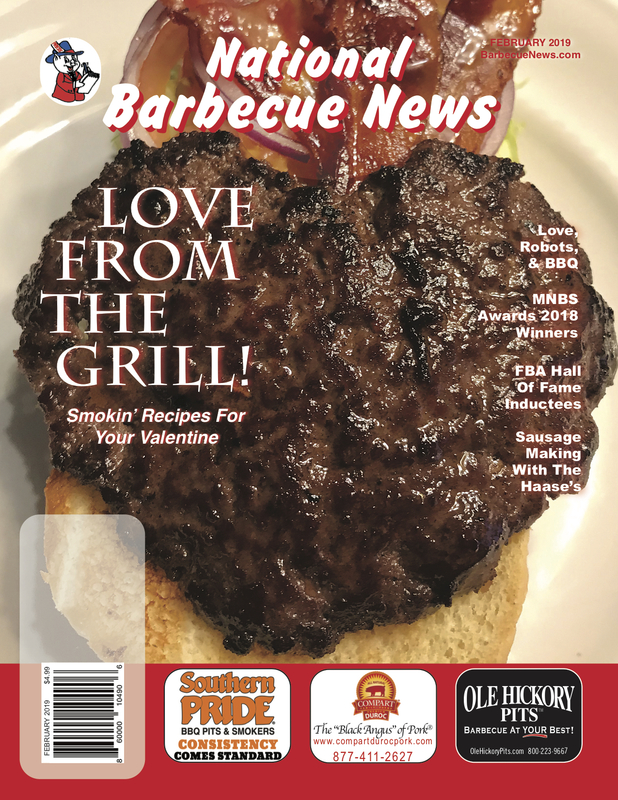 • Smokin’ Valentines Day Recipes – Ray “BBQ Buddha” Sheehan shares his recipes for Smoked Prime Rib and more. • There’s Love…I Mean Smoke In The Air – Chimney Cartel leader Vic Clevenger talks about the love of BBQ. • Barbecue In The Age Of Intelligent Robots – Barbecue Hall of Famer Ardie Davis shares his thoughts about future bbq. • NBBQA February Information – NBBQA shares cold weather cooking tips and gives April conference updates. • Northeast Barbecue Society – Competitor spotlight on Kids Q Team Hokie Pokie Q Next Gen.
• Steak Cookoff Association – SCA Rep. Danny Kennedy shares his story and Naples results shared. • Minnesota Barbeque Society Celebrates Their 2018 Winners – MNBS hosts their 2019 annual meeting.